Born in 1757, Cornelia Knight was the daughter of Sir Joseph Knight, a navy officer knighted by King George III, and his wife, a well-educated and accomplished woman praised for her conversation skills. Cornelia was sent to London College, where she learned several European languages, including Latin. In 1775 Sir Joseph died, leaving only a small income to his wife and daughter. Because of that, they decided to move to Naples, where they took part, in 1798, to the celebrations for Nelson's victory at the Battle of the Nile. They two women also became good friends with Lord Nelson and the Hamilton. The following year, Cornelia's mother died too. The Hamiltons and Lord Nelson thus decided to ask her to accompany them back to England. Once back in England, Cornelia settled independently, although she continued to visit her friends. She also wrote a lot and soon gained the reputation of a learned author. 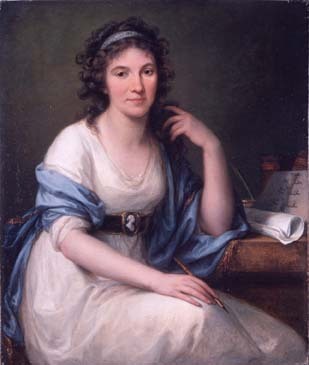 Among her works are Flaminius (an epistolary romance in Rome - 1792) A Description of Latium, or La Campagna di Roma (with her own etchings - 1805), and Translations from the German in Prose and Verse (1812). She also wrote a journal and an autobiography, which was incomplete at the time of her death. But while she was alive, she was very discreet. In 1805, she was appointed companion to Queen Charlotte on the recommendation of another of her ladies, the novelist Fanny Burney, and, in 1812, she held the same position in the household of her granddaughter, Princess Charlotte of Wales. Cornelia, who was nicknamed The Chevalier by Charlotte, became a close friend and confidant of the young Princess. Cornelia felt very sorry for Charlotte. Her father, the Prince of Wales, knowing her daughter was much more loved and popular than him, kept a close eye on her, had spies in her household (and expected Cornelia to be one too) and didn't want her to have her own establishment until she married. "Every consideration," Cornelia wrote, "was to be sacrificed to the plan of keeping the Princess Charlotte as long as possible a child; and, consequently, whoever belonged to her was to be thought a nurse or a preceptress". But Cornelia wasn't the right sort of person for such a job. Loyal to the Princess, she did everything she could to help her and thwart her father's plan. For instance, when the Morning Chronicle wrote that she had been appointed sub-governess, she insisted they rectified the mistake and announced her role as lady-companion instead. And when she accompanied the Princess in public, she always acted as she was was in attendance rather than in charge. In 1814, The Prince of Wales decided to dismiss Charlotte's entire household. Among other things, he had discovered that the Prince August of Prussia had been paying court to Charlotte at her house, and that Prince Leopold of Saxe-Coburg had visited her too. Cornelia had insisted that Prince Leopold had behaved properly, and defended Prince August too. Cornelia had actually helped Charlotte meet with August, even leaving them completely alone, as she hoped he would marry Charlotte. The Prince of Wales, instead, wanted her to marry the Prince of Orange, whom Charlotte disliked, and was determined to keep her daughter under even closer confinement. So, everyone had to go. Charlotte and Cornelia kept writing to each other though and, after the Princess married Prince Leopold, Miss Knight visited the couple frequently. Unfortunately, the Princess would die in childbirth, leaving her family, friends and the whole country devastated. After she had lost her job as companion to Princess Charlotte, Cordelia took up teaching to help pay the bills. She taught the young Massimo Taparelli, the Marquis d'Azeglio (an Italian writer, painter and politician) English,science, literature, and fine arts. Cornelia spent the last 20 years of her life abroad, and died in Paris on 17 December 1837.